Editor's Note: Today we have another great piece from Christy Gualtieri. Be sure to check her out on Twitter @agapeflower117 on Twitter and on the interwebs at asinglehour.wordpress.com. Do you ever wish God would tell you how to vote? Not in a prayerful, “I think this is what God is telling my spirit” sort of way, but in a real, tangible, voice-from-Heaven that tells you: “Vote for X” ? That’s what I want. I want God to physically tell me lots of things, but especially, in this current political climate, how to vote - not so I can rub it in people’s faces or hold it over their heads, but because I would know what God’s will is in this situation and would be able to follow through. I know that although there are certain people God actually talks to, I am not one of them. But oh, how I wish I were. Today’s political climate is an absolute minefield of nonsense and confusion and what feels like all-out danger. I do have to remember, though, that it’s not really a modern problem. The political structure in Jerusalem during Jesus' time was just as filled with conflict and the trouble of the socio-political roles people filled. And although people followed Jesus for many different reasons, some people followed Jesus for the exact reason that they believed that as the promised Messiah, He would overthrow the current political structure and become King. Jesus, as we now know, is a King - just not what they expected. I considered myself apolitical for a long time, completely indifferent to the science behind government. Most of that was due to my interests growing up, which revolved around books and movies and nothing about government, and my natural, all-consuming teenage life of self-interest. I was provided for, and I never gave that much thought to where that provision came from. All I knew were basic American economics: someone goes to work, they get money, they pay bills. Of course, as I've gotten older, I've become more knowledgeable about the system, and like any member of society, developed a personal opinion about the role government should play in people's lives. I tend to feel as though the government, which was supposed to be by the people and for the people, should look after, you know, the people. I also know, however, that the government listens a whole lot more to people with money, which is interesting because a lot of the people who live in America (those people) don't have a lot of it. As a result, I am pretty cynical about the whole thing altogether. But mostly, and for a long time, I craved the idea of separation between Church and State. Not so much because I disliked the idea of politics mentioned during Mass, but because I didn't want my faith tainted by politics. I didn't want to think about leaders of our Church acting like elected officials, making promises they didn't intend on keeping once they were in office. And it was one thing to talk about things like taxes and health care, and another thing entirely to talk about someone's salvation. And honestly, I struggled a lot with where the lines were. I would become incensed at Mass when the lector would mention, during a time of intercessory prayer, an upcoming bill to pass in the House of Representatives. I didn't want my pastor's opinion on whatever law passed recently. I didn't want to pray for the conversion of the President. I wanted my faith to be very clean, very holy, very far away from the fear-based hate-mongering that lingered around the American political system. ...Then, I realized I was Catholic; and as such, there is no such real thing as a separation between Church and State. There is, I suppose, a thin line; but as a Catholic, there is no real choice but to be immersed in a world where politics exists because that is where the Church is, where it lives and breathes. "Did you know," a young religious Brother told me once, "that for a long time, if you were a Catholic in the United States, you were a Democrat?" "In fact," he continued, "The term 'bleeding heart liberal' was actually used to describe Catholics. 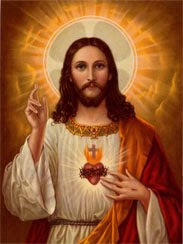 A few Catholic senators had pictures of the Sacred Heart of Jesus in their offices, and when Republicans would pass by, they'd mock them, saying, 'Oh, you bleeding-heart liberal.' It was only after a lot of the social issues crossed over party lines, things like abortion and gay marriage, did people move over and become Republican." In the Gospels, Jesus changes the essential core beliefs for many of the people whom He meets. He works miracles on holy days, making the religious people angry; and he doesn't directly overthrow the Roman government, making the common people angry. He was, in a sense, what we might call a moderate: someone who understood the need for the existence of power yet did not fail to see the ones who needed it. I talked about this with my brother once, who works in the Church. "When you read the Gospels," he said, "Notice how Jesus' actions move from charity to justice. He starts out healing others and performing miracles - healing the lepers, water into wine, all of that. That's charity, and it takes place outside the city. But it's after he gets to Jerusalem, the center of urban activity, where you get the cursing of the fig tree, the cleansing of the temple, and the lament over the city. Jesus gets angry; He starts to demand justice. He's faced with the poor, with the downtrodden, with the actuality of poverty and an understanding of a people who are being taken advantage of by the government." "So what's the answer?" I ask. "The answer is people helping other people. It doesn't have to be anti-government; it has to be pro-neighbor." Matthew's Gospel says this about Jesus' attitude toward Caesar, the representation of the government they lived under: "And Jesus said to them, 'Render to Caesar the things that are Caesar's, and to God the things that are God's.' And they were amazed at Him." The more I read about the idea of Kingdom and majesty in terms of government and Jesus' role, the more I understood that Jesus was okay with the idea of government because He knew that it was ultimately created by Man, and so would not have the last say; that is, it would not be the deciding factor of all things good and evil. Sure, people could corrupt their governments and thus its citizens, but at the absolute end of everything, it is God that is left, not the power of men. Jesus' surety of His place and His role allowed Him to take (with a boulder of salt) what men in power did because 1) He held Himself as a member of another Kingdom, where governments like ours will mean nothing in comparison. I give Caesar what is Caesar's: I pay my taxes, I vote in elections, I try to stay as informed as possible on civic issues. I give to God what is God's: I go to Mass, I give to the poor, I learn as much as I can about my Church and what it teaches, then try to practice it to the best of my ability. I tell others about God in ways I feel they would understand. And I try to follow Jesus' example and stop worrying so much about it. Ultimately, all of the politics and the governments and the hierarchies of the world will all fall away. This will happen for me when I die, and it'll happen when the world as we know it ends, when Jesus comes back to claim what's His. There is so much noise about politics in America that it's all I can do to throw up my hands, and while the nations rage, go into the kitchen and make a sandwich. Then I’ll try my best to go out in the world and be as pro-neighbor as I can.